Thursday June 29th – What Are You Waiting For? https://chartfreak.com/wp-content/uploads/sites/18/2017/06/GOLD-CLOCK.jpg 563 876 Alex - Chart Freak https://chartfreak.com/wp-content/uploads/sites/6/2013/04/black_logo.png Alex - Chart Freak2017-06-29 12:02:022017-06-29 12:13:56Thursday June 29th - What Are You Waiting For? 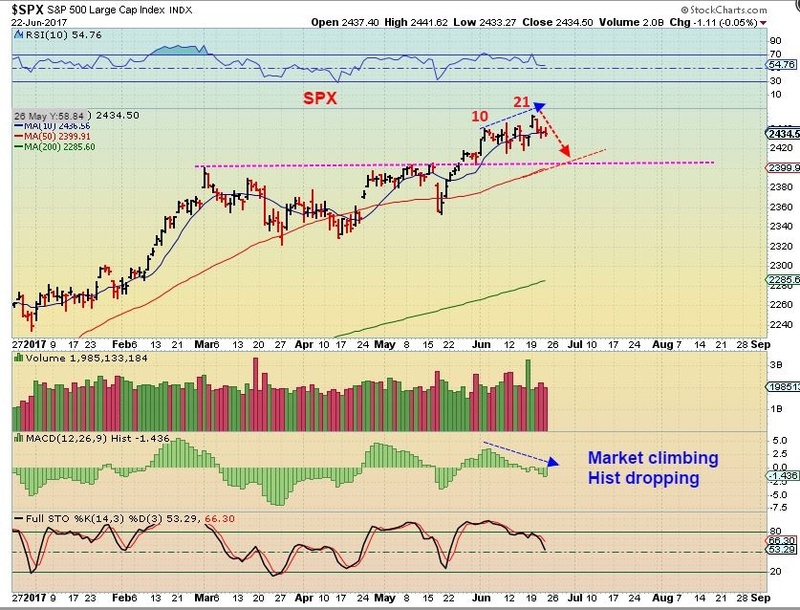 Wed June 28th – Buy The Dip? Buy the dip? I would say that one might want to be careful when choosing where or when to enter this time. 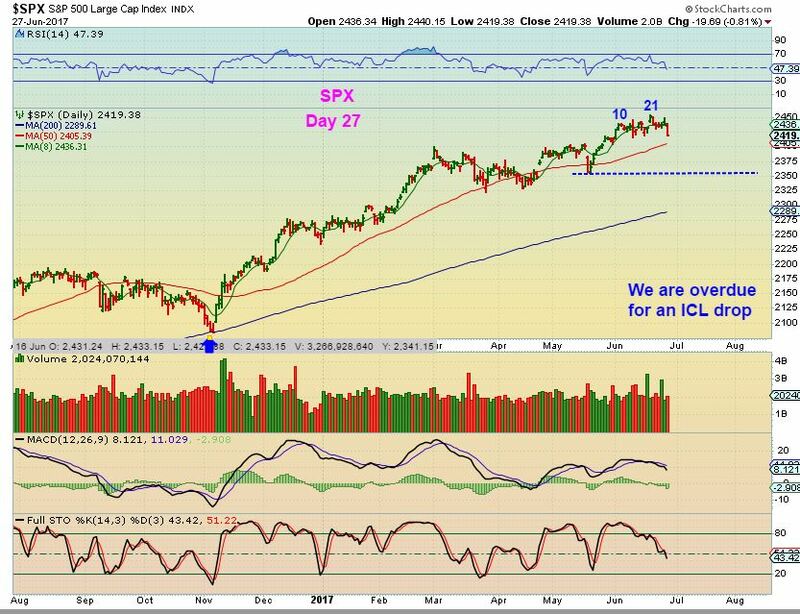 SPX - It is day 27 and there is time to drop further, but we are also due for an ICL (overdue), so this could drop even further than many expect in my opinion. 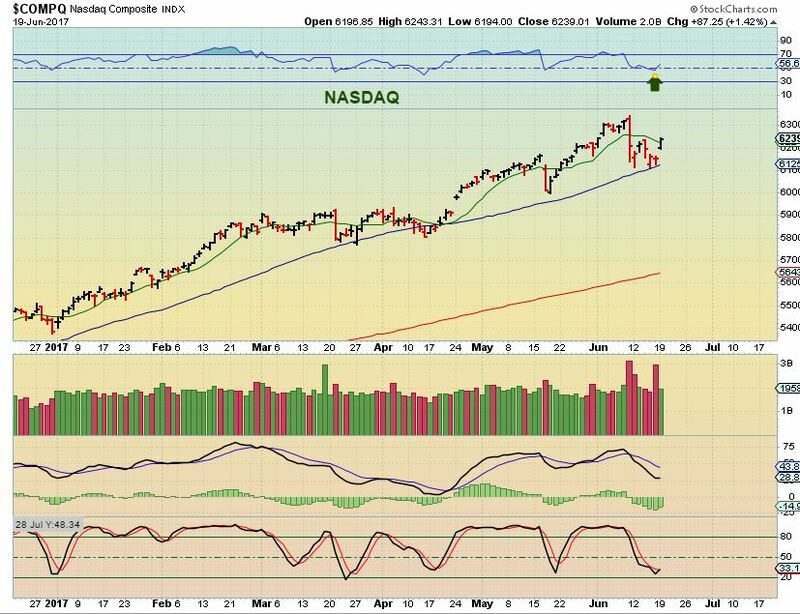 QQQ - Yesterday I pointed out the MACD on the QQQ ( Nasdaq too) . This looked ready to drop. https://chartfreak.com/wp-content/uploads/sites/18/2017/06/BUY-THE-DIP.jpg 541 831 Alex - Chart Freak https://chartfreak.com/wp-content/uploads/sites/6/2013/04/black_logo.png Alex - Chart Freak2017-06-28 11:18:522017-06-28 11:18:52Wed June 28th - Buy The Dip? In the last few reports I have been discussing a good number of bullish trade set ups that have been forming after sell offs and consolidation periods. In some areas, the entire sector seems to be reacting. We will continue that discussion today. 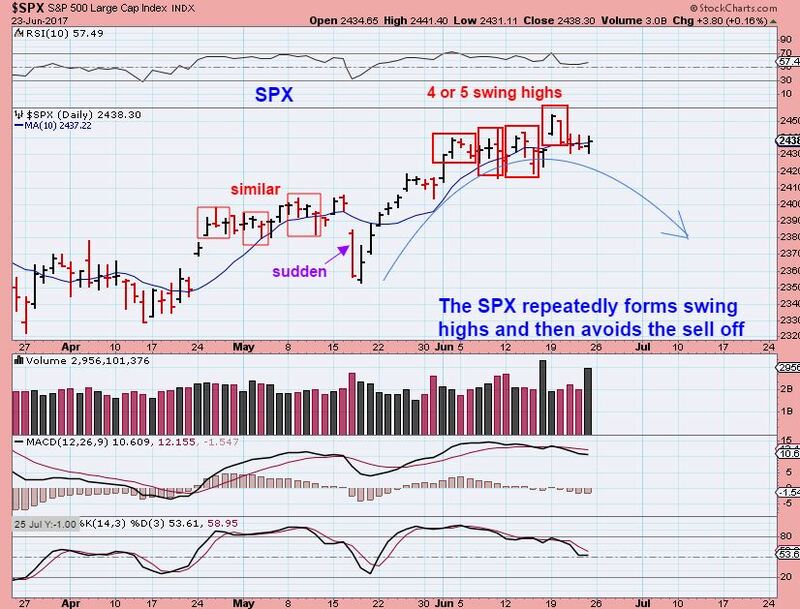 SPX FROM JUNE 23 - The bulls and bears are battling, but this looks like a topping process. We are due for a correction in the general markets. 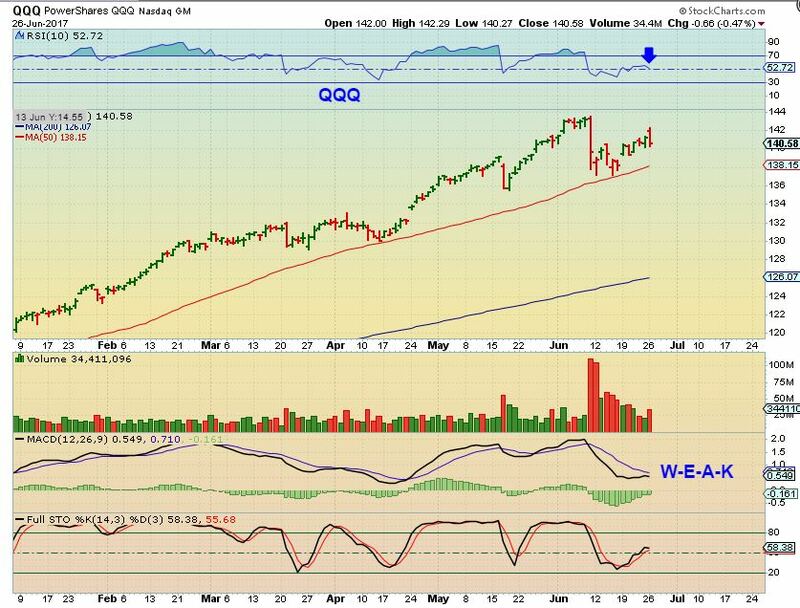 QQQ - Monday saw a bit of a bearish reversal in the Q's, and that MACD is not showing signs of strength. 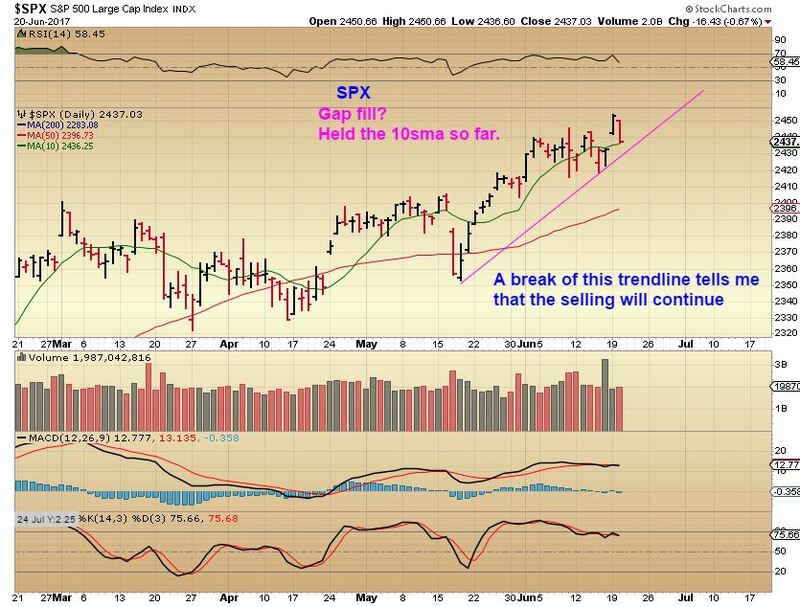 SPX - Fridays report - We could dip down and back test the break out. SPX - We do have a swing high in place, but that has happened a lot lately. We closed below the 10sma, but then recovered it. The bears take control and the Bulls buy it back. 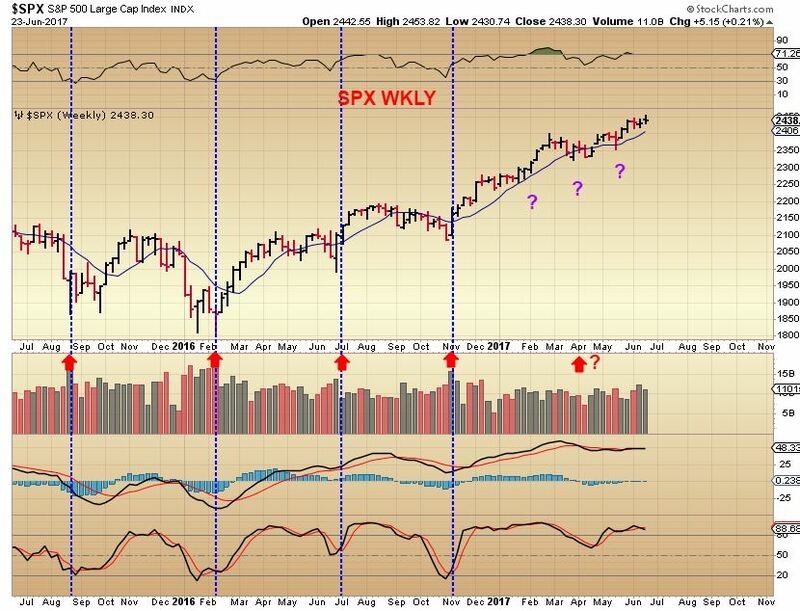 SPX WEEKLY - The weekly chart bullishly climbs along the 10ma. SPX - We are really well along in the entire intermediate cycle, so I would expect this daily to top and become L.T. and begin to drop. We are overdue for an ICL, but these markets have just been pure bullish. Thursday June 22 – BOUNCE? 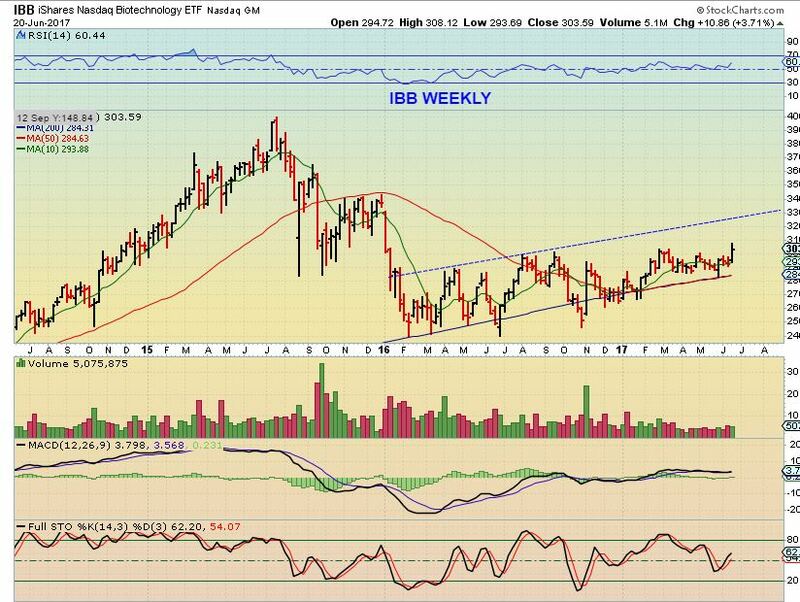 This was my IBB Weekly chart on June 20th. It is breaking out in bullish manner ( It hit 316 yesterday) and has the potential to get to 330 in a few weeks. 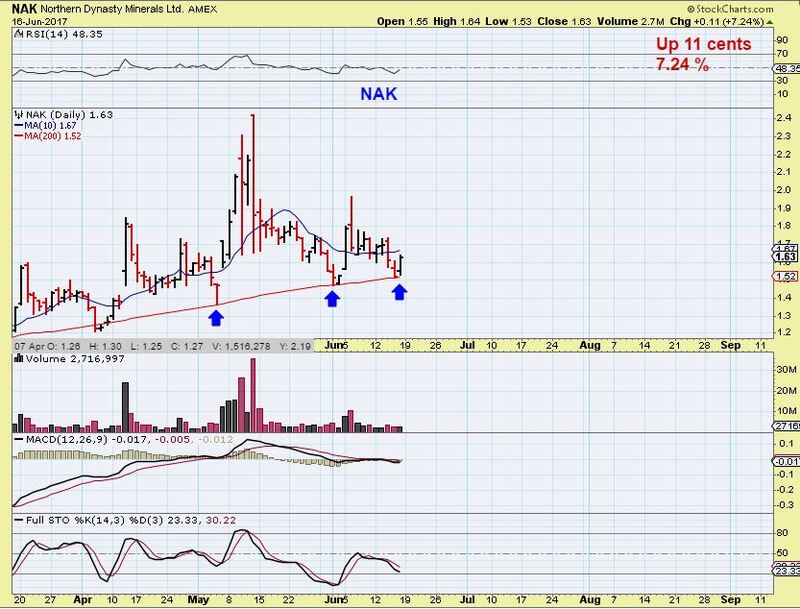 The daily chart could back test the break out or it may just bull flag and continue higher. I will discuss this further later in the report. https://chartfreak.com/wp-content/uploads/sites/18/2017/06/BOUNCE.jpg 535 796 Alex - Chart Freak https://chartfreak.com/wp-content/uploads/sites/6/2013/04/black_logo.png Alex - Chart Freak2017-06-22 12:19:142017-06-22 12:33:04Thursday June 22 - BOUNCE? So far, The SPX has put in a swing high every 4 days or so, 🙂 and here we see another one. Since we are getting late in the intermediate cycle, and since we are on day 22 of the daily cycle, I am watching each swing high as a possible top. A break of the lower trendline could escalate the selling, so my stop would be below that. 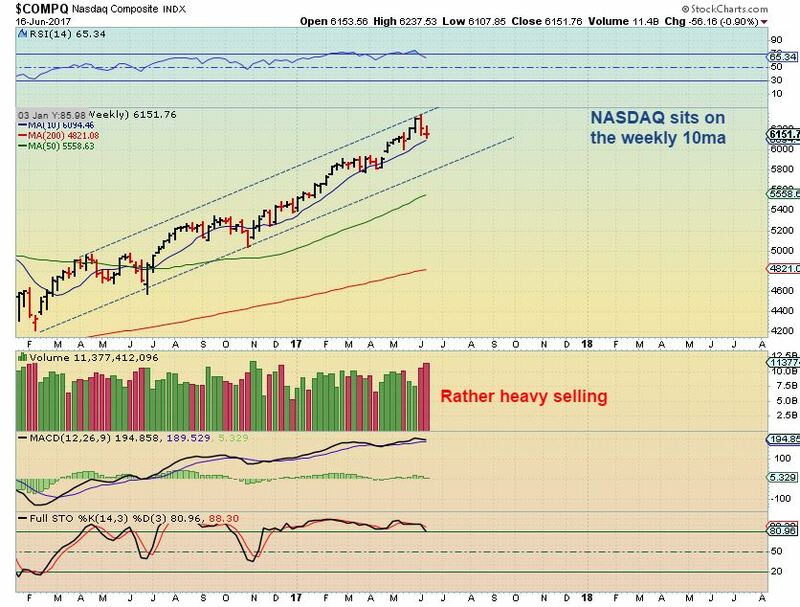 On the weekend, I used this chart to point out that the NASDAQ did find support on the 10 weekly MA. This is often an area that holds as support, so would the markets move higher from here? The markets did move higher, and I would use recent lows as a stop.